New Mexico Youth and Government brings government alive for high school students throughout the state. In addition to high school government classes, Youth and Government adds a new level of experience-based learning on how state government works, the politics that evolve from a natural debate over the issues at hand, and the development of core skills such as leadership and public speaking. Each conference is led by teens elected to office by their fellow delegates. Each state provides facilities and volunteers from various state departments who act as resources for the students while they debate the issues. The volunteers help guide the students through mock committee meetings. Students debate and vote on the bills that their fellow delegates have written and presented. Bills that pass in committee are then taken to the floor of the House or Senate for full debate and vote. Once approved in both chambers, per the state Constitution, the Youth Governor can sign or veto that legislation. In New Mexico, the Youth and Government organization is led by individual teachers or school administrators who volunteer to act as site-based advisors while under the guidance of a state director through the New Mexico YMCA organization. 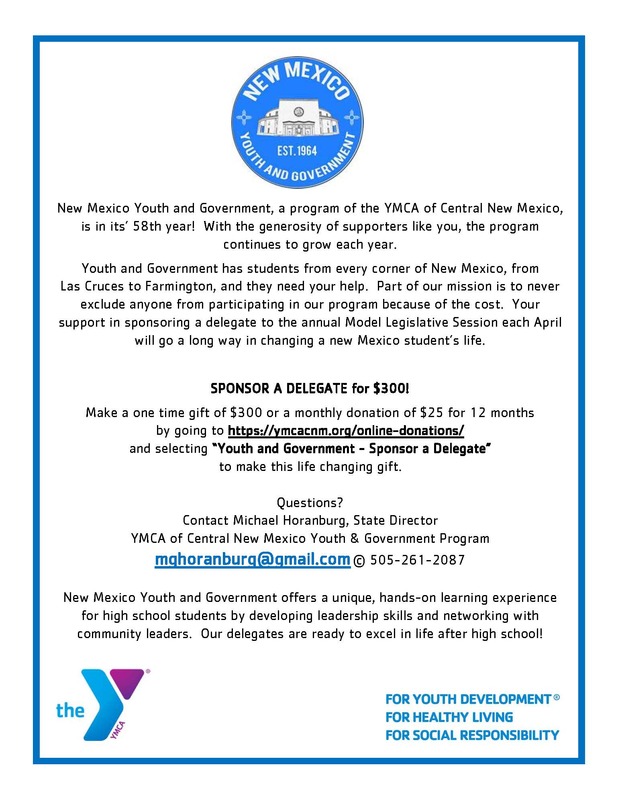 There are 5 ways to participate in New Mexico Youth and Government, a program of the Central New Mexico YMCA. Students can join either the legislative branch, judicial branch, executive branch, or the press corps (print and video). If you would like to make a monetary donation, please visit our secure online donations page. Sign up for our email newsletter to stay informed about the YMCA of Central New Mexico!